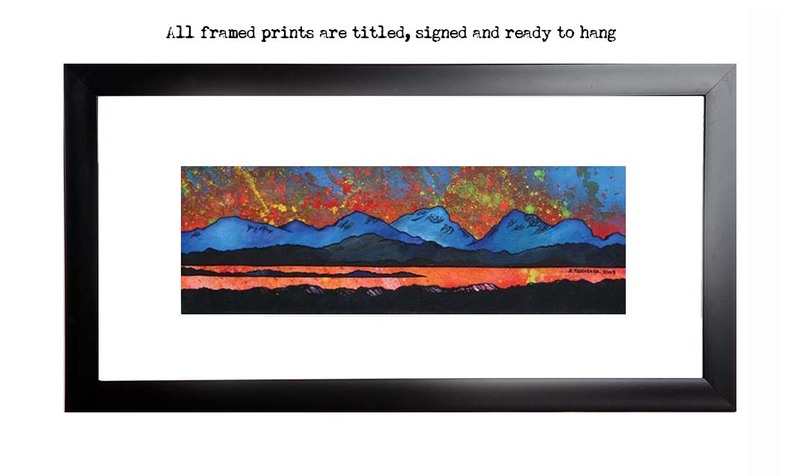 An original abstract, atmospheric landscape/seascape painting of the Paps of Jura from the Isle of Islay, Scottish Inner Hebrides, Scotland. A mix of mediums are blended, layered, scraped and splattered over the canvas to produce a very unique & atmospheric painting, depicting the ever changing wild weather that constantly sweeps across Scotland’s Hebridean islands & Highlands from The Atlantic. More about the Hebrides here. Original mixed media painting in spray paint & oil paint on box canvas. Original painting has now sold. Painting & prints of The Paps of Jura from the Isle of Islay, Isle Of Jura, Scottish Inner Hebrides, Scotland by Scottish landscape painter Andy Peutherer. Framed print of The Paps of Jura from the Isle of Islay, Scottish Inner Hebrides, Scotland by Scottish landscape painter Andy Peutherer.